ASUS has quietly introduced a new lineup of ultra-compact form-factor (UCFF) PCs, with an interesting balance between media playback and display capabilities. The VivoMini VC65-C1 systems are based around Intel’s 8th Gen Core processors, with high-end models also sporting Ultra HD Blu-Ray drives for local media playback. 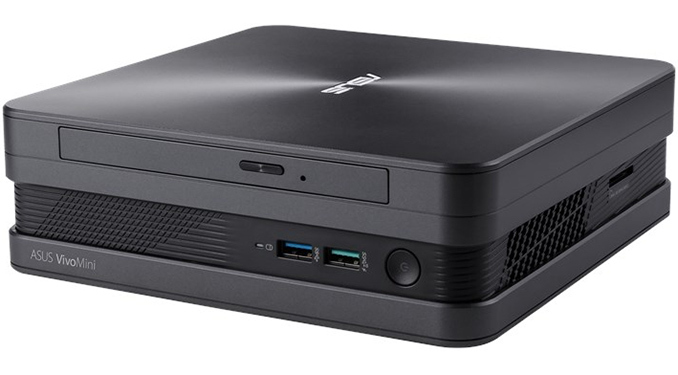 Coming in an iron grey aluminum chassis and measuring 197.5×196.3×49.3/61.9 mm, the ASUS VivoMini VC65-C1 is significantly bigger than Intel’s typical NUCs. But it also offers more features and expandability – and not to mention an integrated power adapter. 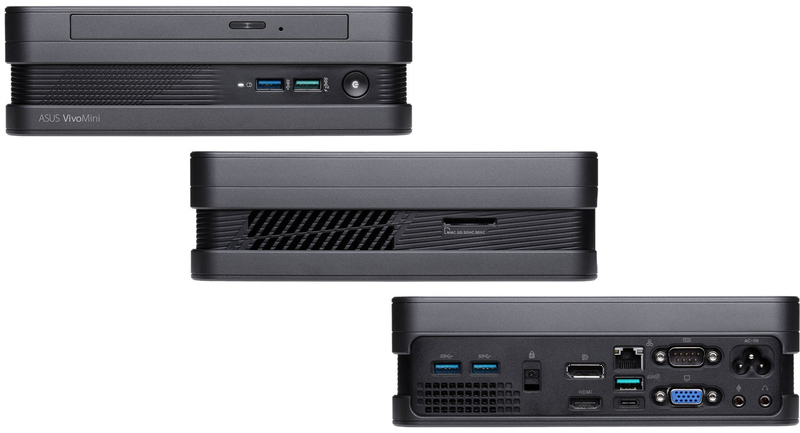 The VivoMini VC65-C1 is based on the Intel B360 chipset and supports a variety of socketed Coffee Lake processors with TDPs up to 35 W. The high-end SKUs are outfitted with Intel's six-core Core i7-8700T or Core i5-8400T, whereas lower-end SKUs use Intel's quad-core Core i3-8400T or dual-core Celeron G4900T/Pentium Gold G5400T (see exact specs in the table below). The VivoMini VC65-C1 has two DDR4 SO-DIMM slots supporting from 4 GB to 32 GB of memory. The system also has an M.2 slot supporting PCIe or SATA SSDs, as well as two or four 2.5-inch bays for SATA SSDs and HDDs. Select versions of the VC65-C1 come with a Blu-ray, DVD-RW or Ultra HD Blu-ray optical drives (the latter are available in Japan). The I/O capabilities of the ASUS VivoMini VC65-C1 are rather vast. The UCFF PC has a 802.11ac Wi-Fi + Bluetooth 5.0 module, a GbE jack, one USB Type-C 3.1 Gen 2 port, five USB 3.1 Gen 1 & Gen 2 Type-A ports, three display outputs (DisplayPort, D-Sub, HDMI), an SD card reader, 3.5-mm audio connectors, and even a COM port (presumably for the embedded systems and/or digital signage markets). DRAM Capacity 16 GB 8 GB 8 GB ? Storage M.2 128 GB 128 GB - ? DFF 500 GB HDD 500 GB HDD 1 TB HDD ? ODD UHD Blu-ray DVD-RW UHD Blu-ray ? MSRP ? ? ? ? The VivoMini VC65-C1 from ASUS is a rather unique PC that can be used equally well both in the living room and in the office. On the one hand, systems with a Blu-ray/Ultra HD Blu-ray drives can be used as HTPCs to playback 2K or 4K movies in premium quality. On the other hand, multiple display outputs allow usage of two 4K monitors as well as compatibility with legacy LCDs with a D-Sub input. ASUS plans to start sales of various VC65-C1 systems shortly. Prices remain to be seen. I'm not personally aware of anyone who uses a "Ultra HD" branded Blu-ray drive. The DRM requirements are just too extreme to be worthwhile (I think PowerDVD is still the only way to do it with an official drive). For Ultra HD Blu-ray playback a standalone player is the better option. I do, both ways. The requirements are still there in a standalone player, just half of it is shielded from you. The requirement on a PC is not that complex. Certainly no more complex than 4k DRM media requirements in Windows. It is. You're telling me you have 17+TB of storage used by stuff that's also on your BR discs, instead of having 17+TB of free storage and play the discs however and wherever you want. It's like buying a truck to drive your car around in. What good is free storage? Ostensibly, he bought the storage specifically to store movies, and didn't have any other purpose in mind to use it. > ...and play the discs however and wherever you want. As long as that place has a Blu-ray player, as opposed to a ripped file which can be played anywhere that has an internet connection. > Why am I buying a BR discs if I then need to pay another $1000 to buy 8TB drives (with redundancy) to hold my 17+TB collection of ripped BRs that I already paid for? Convenience and quality, mostly. It's difficult to get quality better than a Blu-ray can provide, but discs are less convenient than accessing a server. By ripping Blu-rays, I (or anyone else) can get the same quality as a Blu-ray with the end-user convenience of something like Netflix, and all I need is a bunch of storage. I own a UHD-capable USB Blu-ray drive. My kid has a gaming PC that meets the requirements for playback in PowerDVD. I don't think the drive has ever been plugged in to that PC.